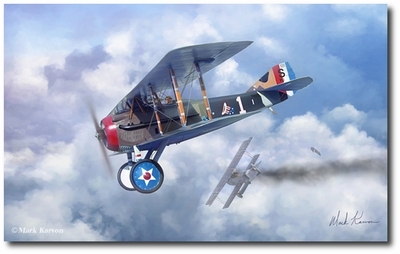 Known as the �Hat-In-The-Ring� Squadron, the 94th Fighter Squadron is one of America�s oldest units in the US Air Force and was deployed to France during World War I. Eddie Rickenbacker served with this squadron in 1918 initially flying the Nieuport 28 then moving to the SPAD XIII aircraft. His success with the unit eventually led to him becoming the group�s leader. Captain Rickenbacker became America�s top scoring ace of the war with a total of 26 aerial victories and was awarded the Medal of Honor for his service. 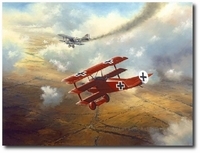 This print is representative of one of his 12 victories over the Fokker D.VII.